Shoulder impingement is one of the most common causes of shoulder pain. 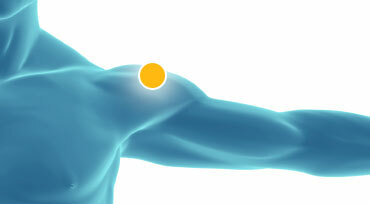 It occurs when tendons in the shoulder become trapped causing pain, weakness and loss of function. Pain and difficulty lying on the affected side when sleeping. Pain in the shoulder and upper arm when lifting the arm above shoulder height. The acromioclavicular joint is a bony arch positioned just above the shoulder joint, formed by the acromion process (part of the shoulder blade) and the clavicle (or collar bone). After years of wear and tear to this joint the body lays down bony spurs (or osteophytes) in an attempt to protect the area. These bony changes can then impinge the tendons and soft tissues that lie in between the shoulder joint and the acromioclavicular arch. The shoulder is extremely dependent on the muscles around it to move the scapula (shoulder blade) out of the way of the shoulder joint, in order to give the shoulder its full range of movement. When these muscles become weak, they loose control of the scapula and this can impinge on the tendons of the shoulder. Our posture can be a common cause of shoulder impingement. This is typical of a patient with thoracic kyphosis (or slumped posture). Increased thoracic kyphosis can cause the scapula (shoulder blades) to move forwards making the shoulders more rounded. The altered position of the scapula reduces the range of movement in the shoulder joint and this predisposes the joint to impingement. People who perform repetitive arm movements above their head such as throwing, shelf stacking or hedge trimming can be at risk of shoulder impingement. As you raise your arm the space between the head of the humerus (the “ball” of the ball and socket joint) and acromio-clavicular arch becomes less. This increases the potential for impingement of the tendons that run through the subacromial space (the space between the acromio-clavicular arch and the shoulder joint). In addition to this, a sudden over head arm movement may cause these tendons within the subacromial space to tear, the tendon then becomes inflamed and this can lead to further shoulder impingement. Our highly experienced physiotherapists can provide you with a thorough examination and a diagnosis. From our findings we will create a personal treatment programme that will focus on areas such as reducing pain, regaining range of movement, strength and stability. As you progress we can adapt your treatment so that your rehabilitation will be specific to your work tasks and/or sporting activities. The following are some of the treatment options we can offer to those suffering from shoulder impingement. Manual mobilisation therapy – These are passive movements that the therapist applies to the spine to increase range of movement, reduce stiffness and pain. Soft tissue massage – can reduce muscle tension, improve tissue mobility, enhance muscle contraction and desensitise any painful and overactive areas. Ultrasound Therapy – Can speed up and optimise the healing process. Acupuncture – Can stimulate the body’s natural healing response, release pain-killing endorphins and improve functioning of the hormonal system. Interferential Therapy – Can provide pain relief, muscle stimulation, enhance blood flow and reduce oedema. Exercise and Rehabilitation – We can provide you with exercises that can safely target the right muscles in order to regain both strength and stability. Ergonomic and Postural advice – Can help you manage your day to day activities whether you’re sitting at a desk or trying to get a good night’s sleep.